There may have been a time when I would have been excited about this album – probably when reggae was relatively new to me, when solid rhythms, a mix featuring lots of horns and other musical textures, and apparent sincerity in the vocals and lyrics were sufficient to bring a smile to my face and a skank to my step. But I’ve grown up a bit, and listened to a wealth of other albums of reggae’s roots, trunks and branches, and now it takes something special to satisfy. So put it down to too much exposure if you want, but I need something unique or challenging or at least mildly different. I don’t hear any of that on Movin’ Ahead. 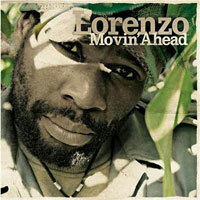 As I’ve implied, however, if all I still needed was my standard fix of competent, contemporary rootsy-ish reggae, then sure, I’d turn to Lorenzo for it. The mostly Rasta themes, along with a smattering of the love stuff and the social commentary stuff, are well supported by the usual arrangements and somehow-familiar tunes, and a couple of guest appearances (Chezidek and Spectacular) provide a little variety. The whole thing – over an hour – flows by without bumps or jolts. And that’s the problem. Previous postCD Review: See-I, See-I Next postCD Review: Inner Visions, Stay Alive!